Located on a large, flat hill within the center of Ashara, Castle Myrkur is the royal citadel of the kingdom of Gwynne and home to its famous Crimson Throne. This large, ancient fortress has a long history. In fact, in the Late Third Age, the site upon which the castle now stands was once an Ashanti temple called "Myra-Kur." When the Thannish began migrating into the region, the Ashanti were driven out, and their temple was destroyed by a Thannish warlord named Gareth Gwyharë. 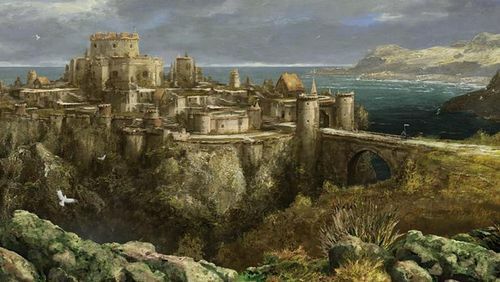 Gareth then took over the Ashanti settlement of "A'Shorah," which would later become the city of Ashara, and built a magnificent fortress for himself directly over the ruins of the temple. The House of Gwyharë did not hold the castle for long. By the Year 0038 of the Fourth Age, the region was engulfed by the Thannish Civil War; fought between two brothers: Eldan Durethë and Rhodan Mallistäer. After Rhodan's defeat in that conflict, he chose this fortress as his new citadel when he formed the Kingdom of Rhodara. To gain possession, Rhodan married Lady Elspeth Gwyharë and essentially took over her family home. For another 1,226 years, a total of 52 successive monarchs of Mallistäer Dynasty ruled Rhodara from this castle. That all ended In the year 1264/4, when King Radovan Mallistäer II was killed by the Vilzari at the Battle of Flint Harbor. The castle was then taken over by King Gayorg Gwyharë; who felt it was his birthright as a member of House Gwyharë. Gayorg ordered the castle enlarged and built many secret dungeons and halls deep beneath its walls. By this time, Gayorg was secretly an agent of Alokkair and was worshiping sorcery and the dark arts. Unspeakable acts of horror and depravity took place in the castle over the next 25 years. Finally, Gayorg was slain in the Battle of Keslyn, and soon after, the city of Ashara was sacked by Rhodara's enemies. The castle itself was burnt during the sack of Ashara, and the famous Granite Throne in its Great Hall was smashed. Years later, the ruined castle was rebuilt by Grenn Gwyharë and an opulent new throne was installed within its Great Hall. Grenn called his new seat, the "Crimson Throne," for his sigil was a golden rose on a crimson field. From that point on, the fortress has always served as the royal citadel of Gwynne. Today, however, due to Gwynne's poverty, the castle is in a state of disrepair and many of its rooms are unused. The fortress has a garrison of 1,500 extremely loyal, well-equipped soldiers. The regular garrison is divided into nine companies of 150 soldiers. A tenth company, known as the "Sable Company," consists of a single, well trained, lavishly equipped force of 150 elite knights; commanded by Captain Marcus Ezrin. The Sable Company serves as bodyguards for the King and his family.